December is without a doubt the most popular month for domestic travel. Christmas Holidays, public holidays, School holidays and great weather all make December arguably the most expensive month of the year to travel. The 16th, 25th and 26th are all public holidays. This year school holidays start on the 10th, and as you can imagine flight prices are much higher around this time. Flight prices on the 12th, 19th and 29th are also a little higher on most routes. All of the airfares listed below were the cheapest we could find on FlySafair flights for each day in December 2014, when we set this up this survey on the 10th of October 2014. Remember the longer the amount of time that has passed since we set it up, the greater the chances are that the airfares have changed. For the most current airfares please go to the FlySafair website. FlySafair JHB to Cape Town : The first day of the month is the best day to fly on as it is the least expensive, while the 20th is the most expensive. FlySafair Cape Town to JNB : The beginning of the month had the lowest airfares with prices increasing to the end of the month. FlySafair Cape Town to Port Elizabeth : Try flying during the middle of the week and avoid Saturdays if you can. FlySafair Port Elizabeth to Cape Town : Looks like your going to be paying around R499 or R599 for a one way flight, thats quite a low airfare! FlySafair Cape Town to George: Take your pick! This month is wide open with low airfares available during the majority of the month. 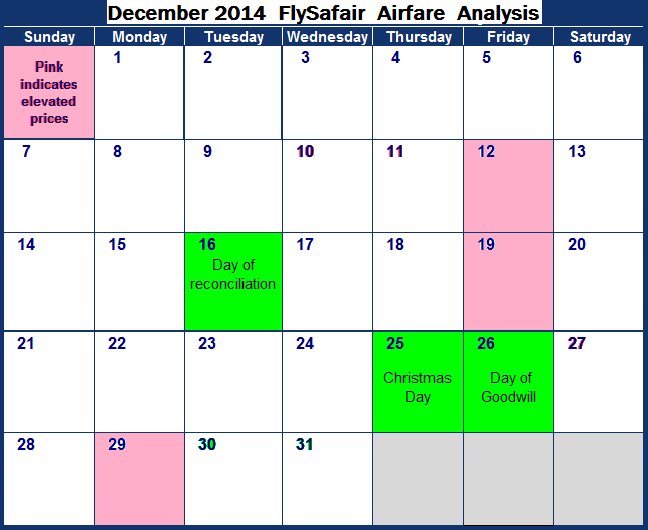 FlySafair George to Cape Town: Aim for either the 12th, 14th of 26th, as these dates are the most affordable.